Marvel Knights: Black Panther - DVD Trailer " BRINGS THE HYPE!!!!" This was like watching a trailer in the movies. Excellent editing. This should definitely be made into alive action film. I hope Reg has a few autograph copies left. Here is the link. http://www.youtube.com/watch?v=Rxd3Vsnoqvk Panther fans rejoice. Re: Marvel Knights: Black Panther - DVD Trailer " BRINGS THE HYPE!!!!" I have to give you a PERSONAL THANK YOU! This was such a beautiful piece of work. I have waited a life time to see something like this, featuring one of my favorite comic book characters. I share it with the kids. And they know they can be more in life--President. And they can enjoy a comic hero that looks like them. I picked the DVD up last night. Watched the whole thing through, while I was working at my art desk. It was... awesome! I loved the re-imagining of Reggie's original six issues and the inclusion of Storm. JRJR artwork animated? Even more awesome! Plan to watch it again tomorrow. Thank you so much. And welcome to the forum. where can i digital download . it's not on itunes. 1. Captain America - A SUPER SOLDIER gets it handed to him easily by Black Panther. Not to mention, he comes off as NOT Captain America. He wants to fight BP because......??!! Ummmh, No. 2. The US is portrayed as being some gov't run by unpowered supervillains who hire mercenaries to take out Black Panther. Why??? If the US wants to take over Wakanda, SHIELD, Nick Fury. 3. Black Knight gives some outlandish speech about Christianity being needed by the Africans, umh Christiainity has been in Africa since the time of the Apostles. Go read a history book Hudlin! 4. BP goes after the dictator of neighboring Niganda. Why??? HE LEAVES HIS COUNTRY UNDER ATTACK!!! Is BP simple? 5. The Catholic Church is still fighting Holy Wars??? Moreso, why are they even involved?? 6. The Wakandans are portrayed as being oh so virtuous and not one of them, NOT ONE is a scummy lowlife. But the US, Catholic Church and the "EVIL" corporations of the world are. Why then is Wakanda still around. I don't care how tough and "advanced" they are. If everyone on the planet is out to get you. IT'S OVER, nuff said. 7. Black Panther comes off more as a simple-minded, angry angst ridden over-edumacated (yeah i spelled it right) juvenile with issues from one of our "glorious" politically-correct institutions of higher unlearning then the anyone I'd let run my toilet much less a country. To the writers and producers of this tripe and at Marvel. Stop Producing Garbage!! Do you guys even think this through? Please spare us anymore of your politically hacked storylines which even in themselves lack ANY plausibility. It wasn't written for Glen Beck. The story makes a s much since as any of the Tom Hanks movies about the Vatican. Myself and several friends and cousin purchased the dvd on the first day. Everyone loved it, even the ones not into comics. The music video was fantastic. We wanted a longer version of the song and now we have it. Reg's interview was spot on and a welcomed special feature. I constantly watch the trailer and have viewed all the episodes half a dozen times. Love the cover inside and out as well as the dvd label. I've waited a long time for the Black Panther to have a cartoon and this was worth the wait. We're gonna post it on our website and give it a great write up. Just watched the Black Panther Marvel Knights DVD for a second time. Someone should post the Life Styles of the Rich & Murderous segment featuring Niganda President Mmbutu. That was genius. Priest maybe the greatest writer to scribe Panther, But Hudlin had his moments of excellence. Im going to give Reggie his props--He wrote a Cinematic Panther book. And I think it will be appreciated with peeps that see the DVD. Because you cant catch the Nuance of his text by just reading. When a voice actor delivers the lines as intended you can hear the inflection of sarcasm and dry humor. But when read, the same lines get lost in translation and I think that was the case.. Thank you Ture. One of the first compliments I recieved about the series from when it was a short was that the tone comes through much clearer in this format. LIFESTYLES OF THE RICH AND MURDEROUS...I had so much fun doing that. I actually forgot about it until just reading this. My head is so deep in my next project. I bought a copy at Barnes and Noble on the second day of release. With the exception of a X-Men foe that was used (I don't want to spoil anything)It kept true to what Mr. Reginald Hudlin did in the comic. 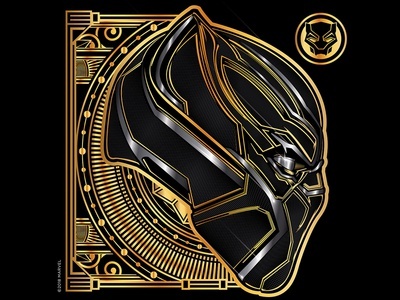 The animation reminded me of the old Marvel cartoons that aired that used the works of Jack Kirby and Don Heck, although with new technology/techniques, Black Panther was much more fluid. Great voice casting and great hearing Stan. I knew it was him as soon as he spoke. I was pleasantly surprised that Kerry handled her character so well. Also I wished there was a commentary track with Reggie and John Romita Jr.
Was it a licensing decision or a creative decision in regards to the usage of the X-Men protagonist rather than who you originally had in the book? Also, It was never stated that the Black Panther had a sister. Is the Marvel Knights line an alternative universe than the original Lee-Kirby Universe? Great work and highly recommended. I look forward to more animated works by Reggie. To answer your question, yes the Rhino was not available because he is considered part of the "Spider Man" family and whatever the deal is with Sony does not allow him to make appearances like that. But Juggernaut was available and considering he's even more high profile after his appearance in X MEN 3, I gladly used him instead. I created Shuri, she didn't exist before, but she is canon now. Thanks for the quick reply Reggie. House Party, Cosmic Slop, The Ladies Man. Bebe's Kids, Boomerang. You and Bruce Timm are the rare cats, that when your name is attached to a project, you can always expect greatness. GODDAMN, THAT TRAILER WAS AWESOME!! !